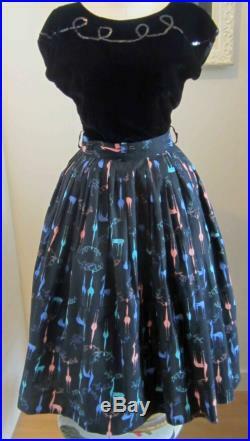 Great vintage 1950's novelty print skirt. 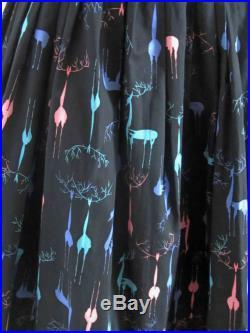 It is jet black cotton with a scene of deers or stags in pink, seafoam and light blue. 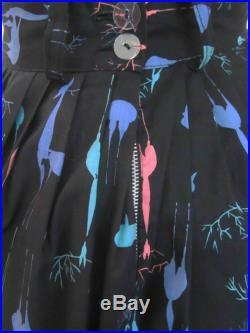 It has several small pleats all around the top and closes at the side with a 6 metal zipper and 2 buttons. It has two belt loops at the front and back. 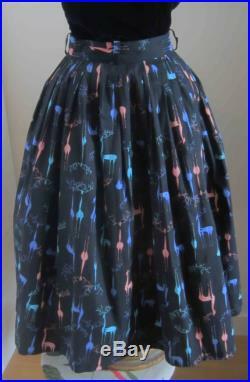 26" at the waist, 30.5 " long from the top of the waist band to hem and the width at the bottom is 50 across. It is more of a full a-line - not a full circle. Excellent condition, no fading and appears to have been unworn. No tags, possibly home-sewn but very well made. Print reminds of me of the fabulous associated american artists prints that are really collectible.